» Why Are the Orioles Still Good? Why Are the Orioles Still Good? Those of us who have been watching the Baltimore Orioles day in, day out for the entirety of this glorious 2012 season find ourselves constantly playing a unique diplomatic role to the world of baseball fans: Explaining Why The Orioles Are Still Good. Because they are good, quite good, 71-57 good, and they’re playing their finest baseball of the year, something they should continue doing until silly chirping excitable types like me come along and jinx the whole thing. The story with the hitting is more or less the same it’s been all year: Pick a couple of names out of a hat before each game and have them hit home runs. They follow orders well! The defense has shored up, mostly thanks to the move of Mark Reynolds from third base, where he would either miss every grounder or throw it backward or whatever the opposite of what you’re supposed to do is, to first base, where he Hoovers up every ball thrown within a mile of the bag. The bullpen fellas, bless their hearts, have been there all year. The “Orange Curtain,” — eighth-inning fire-throwing monster Pedro Strop along with closer (and dare we say team MVP?) Jim Johnson — has provided the O’s with a 55-0 record when leading after seven innings. Did you see what I just wrote? The zero losses when leading after seven innings? The problem, through July, had been starting pitching. Three members of the Orioles’ Opening Day rotation, Jake Arrieta, Brian Matusz, and Tommy Hunter, had to be sent back to the minors, each of them suffering from this little problem where they would give up home runs to every hitter they faced. Jason Hammel, the first-half ace, had to undergo surgery. Things got so desperate that GM Dan Duquette nearly threw millions in cash and top prospects at Philadelphia during the trade deadline just to pick up Joe Blanton, an innings hog about whom there’s little else to say. Now, a month later, the Orioles’ starting pitching is the best part of the team and the reason they’re winning. We’re at the point where there’s die-hard competition just to make it into the rotation going down the stretch. What strange, blessed magic has manager (of the year) Buck Showalter conjured here? 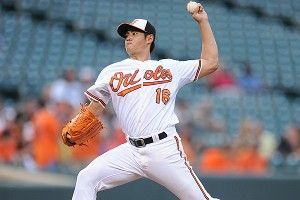 The one constant throughout the year has been rookie Wei-Yin Chen, who, at 12-7 and with an ERA firmly planted in the 3’s, has been doing what the backup cavalry of fellow young pitchers is now doing all year. Chris Tillman, another of the Orioles pitching prospects who’d never been able to locate his fastball until this year, is suddenly 7-2 with a 3.26 ERA after giving up one hit in seven innings against the White Sox last night. He’s 24 years old. So is Zach Britton, last year’s most prominent rookie, who returned from injury mid-season and, after a few poor starts, has given up only two earned runs in his commanding past two starts. Twenty-eight-year-old Miguel Gonzalez has been shaky at times (like the other young pitchers, he sometimes doesn’t have a way to combat the teams that seek to push his pitch count to 100 through 4⅔ innings), but he’s managed to sneak away with a 5-3 record and a 3.54 ERA in nine starts. And Steve Johnson, who is … oh, look, he’s 24 years old! Steve Johnson has served up two wins in his two starts, allowing only two earned runs in each while striking out nine and seven, respectively. On the more established side, Jason Hammel is set to return to the rotation September 6, and over the weekend the Orioles traded for Arizona veteran Joe Saunders, who’s pitching tonight and is expected to fill that “innings hog” role that management once saw fit for Joe Blanton, at a more severe cost. And the rumors that the Chosen One, 19-year-old tip-top pitching prospect Dylan Bundy, may be called up before the end of the season refuse to die. So a month ago, the plan for the Orioles’ rotation going forward was “Chen and then ??? ?” Now it’s “Chen, Hammel, Saunders, Tillman, Britton, Gonzalez, Johnson, Bundy: Pick five.” Buck Showalter will be happy to. Jim Newell (@jim_newell) is a contributor for Wonkette, Salon, and the Guardian.